There's no denying the premium credentials of the Mercedes-Benz E-Class. It's available in a variety of body styles including saloon, estate, coupé and cabriolet, all of which benefit from incredibly sleek exterior styling with flowing lines and elegant features. The interior uses top quality materials throughout and there's ample room to ensure a supremely comfortable ride for driver and passengers. 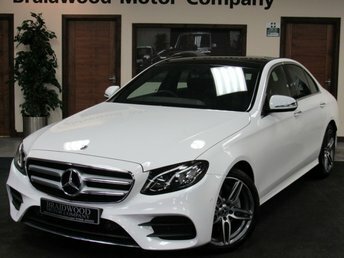 Why not get behind the wheel of a used Mercedes-Benz E-Class in Craigs Hill by paying a visit to Braidwood Motor Company. We supply quality used vehicles at affordable prices and will always go the extra mile to make sure that you find a car that's the perfect match for your needs. Finance is available to UK residents aged 18 years or older, subject to status. Terms & Conditions apply. Indemnities may be required. Other finance offers may be available but cannot be used in conjunction with this offer. We work with a number of carefully selected credit providers who may be able to offer you finance for your purchase, commission may be received. We are only able to offer finance products from these providers. Postal Address: Braidwood Motor Company, Almond West, Carron Walk, Craigs Hill, West Lothian EH54 5AA. Find contact details here. Braidwood Motor Company is authorised and regulated by the Financial Conduct Authority, FRN: 597313. All finance is subject to status and income. Written Quotation on request. We act as a credit broker not a lender. We work with a number of carefully selected credit providers who may be able to offer you finance for your purchase. We are only able to offer finance products from these providers.